Garden City was formed as a village in August, 1885. It was incorporated as a 4th class city in 1897. Our claim to fame is the fact that Tony & Minnie Washington lived in Garden City. If America would have become a monarchy instead of a democracy, Tony & Minnie, who were direct descendents of George Washington would have become royalty. There are people in town who still remember them and some have in their possession prized cut-outs or silhouettes made by Minnie. A monument is located at the Post Office and another at the GC Cemetery, where they are both buried. 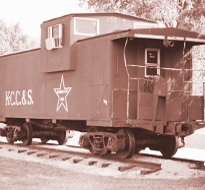 Garden City was established along the Kansas City, Clinton & Springfield Railroad, thus causing most of the town to sit at an angle. After the closing of the railroad, Garden City remained a place to call home. We have had many set backs over the years, but also much progress. We currently operate under a Mayor & four member council and 9 employees. We have a Planning & Zoning Board, a sports association, fall festival board, aquatics committee, and many other fraternal and religious organizations that help improve the life in Garden City - the Lions Club being one of them. With Road & Bridge monies we improved Main Street and West 1st Street - a street leading to one of our subdivisions. With future road and bridge monies, we hope to improve the four-way intersection at F highway and Old 7 highway, our downtown side streets and approximately ten other streets would benefit from improvements. We currently are home to two banks, two restaurants, two taverns, a medical clinic, two tire shops, two auto mechanics, a feed store, floral shop, thrift store, oil company, three convenience stores, beauty shops, real estate offices, insurance office and our newest addition, the Dollar General Store.We are part of the Sherwood Cass R8 School District located 7 miles southeast of Garden City. We are also home of The Training Center, a Christian school for grades PK thru 12. "Garden City, Cass County, Missouri, the center of the garden spot of America - the Modern Eden of the world = may have been the original one. Inhabited by ideal American sovereigns; who own their own homes, owe no man a cent, are at peace with God and satisfied with themselves. No saloons, no dives, no joints, no dens, no questionable drug store. Just the place to raise and educate your family. Never affected by hard times or panics, never takes a step backward. Good people always welcome - come make your home with us. All roads lead to Garden City."